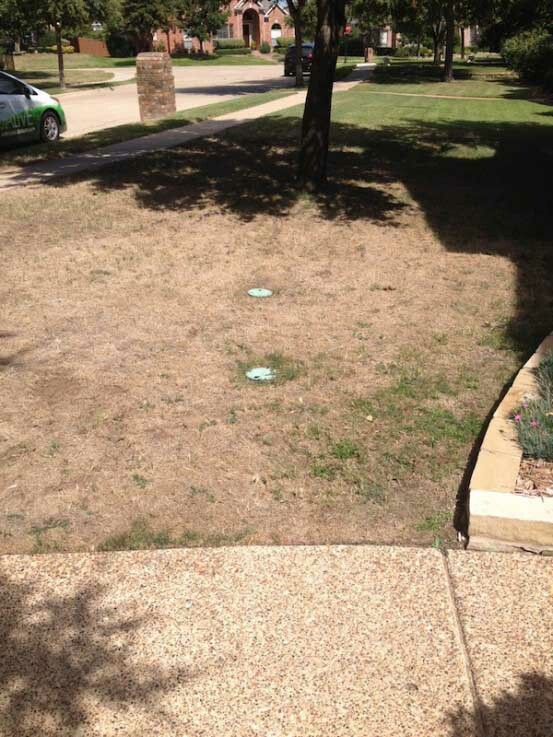 Green Gone Wrong: What happens when you overseed with Ryegrass? In order to keep our lawns green through winter, many homeowners overseed their warm season lawns with cool season grasses like rye or fescue. Let’s admit it: We all love a green lawn year-round right? In order to keep our lawns green through winter, many homeowners overseed their warm season lawns with cool season grasses like rye or fescue. Unfortunately, over time overseeding can damage or even kill lawn. Is it worth having a green lawn for a few months in winter only to destroy your warm season lawn? This already stressed Bermuda Lawn was further stressed from overseeding for four years in a row. Lawns that may already be stressed by drought, over-watering, disease or soil compaction will have an even harder time competing with overseeded grass in winter. Weak lawns won’t be able to handle the competition and they can eventually die out. Cool-season grasses will compete with your warm-season grasses for water, nutrients and light. I have Bermuda grass. Should I overseed? If your Bermuda lawn is healthy and vigorous, you can overseed. However, there are some cautions and tips before you decide if overseeding is right for you. You must have full sun and be prepared to water and mow all winter. If you don’t mind the extra maintenance and care, then overseeding could be for you. But, we’d recommend that you skip years to give your warm season lawn a chance to recover. Transitioning back to warm season grass: Because your warm season lawn could have been damaged due to moisture, light and nutrient competition, there are few ways to minimize damage and ease transition. Do not fertilize ryegrass or fescue in early spring, as this promotes competition with warm-season grass. Once the underlying grass greens up in spring, mow the ryegrass as closely as possible (without scalping the underlying grass.) This opens up the ryegrass canopy and allows light to reach the warm season grass. Once the warm-season grass begins vigorous growth, resume your normal lawn care program. I have St. Augustine. Should I overseed? We never recommend overseeding St. Augustine lawns. Because of the way St. Augustine grows, it can be hard to get good seed contact with the soil without scalping and damaging the existing lawn. Also, Brown Patch is a common problem in St. Augustine lawns, especially if they are over-watered. Because you have to water rye and fescue seed regularly to get it to germinate, you can often end up cause fungal disease problems in your St. Augustine lawn. If you’ve been overseeding your grass and are seeing some residual damage, it may be time to transition back to a dormant winter lawn. Starting an organic soil building program will greatly improve the health of your lawn and strengthen its roots. Over time, you’ll have a beautiful green lawn in the spring, summer and fall when it matters the most! Check out our handy Guide to Overseeding Your Lawn for more specific tips. Ready to heal your lawn? Give us a call!